It is not often, when you have lived in an area for as long as I have, that you discover sizeable parts of it which are not only untrodden by but also completely unknown to you. I thought I knew Wannock fairly well, but for several decades have somehow contrived to ignore the ground which lies immediately to the south-west of it, specifically that served by footpaths leading from Jevington Road and the western end of Mill Way. When I decided to try and re-find Pimpinella major in its last known Sussex station, I had to acknowledge the existence of this ground at long last, Dennis Vinall having recorded it from a copse situated there in 1997 (the first record from this site dating back to 1973). 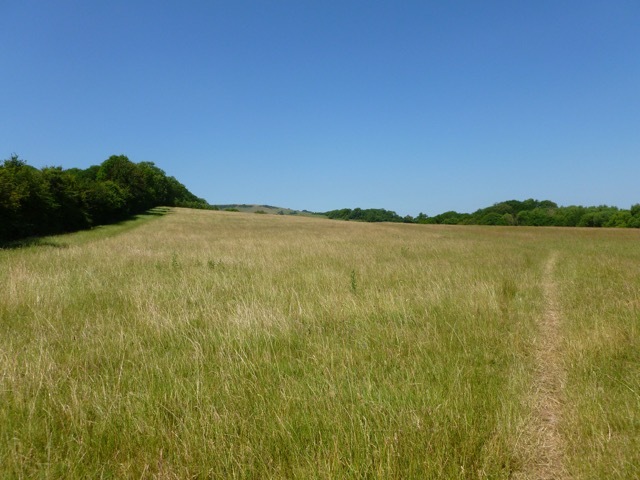 The “missing” area consists of a gently rolling shoulder of chalk grassland, lightly wooded, and a lower lying clay area traversed by a stream. Dennis’s copse lies along this stream. My first visit on 8 June is best thought of as reconnaissance. I walked around the perimeter of the copse, which is barbed-wire fenced, hoping for a glimpse of a tell-tale leaf, knowing it was still far too early for umbels. What was open woodland in the 1970s and 1980s has now been overtaken in many places by dense, possibly impenetrable growth of privet and willow. I returned to the site at the beginning of July, accompanied by Roy Wells, operating on the reasonable assumption that the more pairs of eyes, the more likely the re-find. Equip one of us with a pair of binoculars and you would think you had an observational force to be reckoned with. Assuming that Pimpinella major survives here, however, we were not able to track down our fenced immobile quarry. In the Master Historical Database the status of Pimpinella major at Wannock is given as ‘U’ (unknown). I see no reason to doubt its nativeness. Just as Gymnocarpium robertianum occurs exactly where you would expect it to if it were native in West Sussex, so for P. major in East Sussex. And given Simon Harrap’s dire warnings concerning Diapensia lapponica in a recent piece in BSBI News , I think it would be sensible to adopt a “prove-it-isn’t” rather than a “prove-it-is” mentality in these matters. It might be worth trying to find out who owns the copse and getting permission to go inside it, on the off-chance that it contains more open areas which might still support P. major — although the books tend to indicate that it is a species of woodland edges. It would also be good to know what are the short- to medium-term plans for this area. Some fairly ambitious building is underway in a field immediately to the north-east of the copse, and housing has clearly long abutted its eastern extremity. Neglect poses a more immediate threat to the species at Wannock than does development. At the time of writing the situation is reversible, if only just. This year a gap was filled in the mental map of what I ambitiously refer to as my “local patch”. In future years, perhaps a far more important one can be filled in our records.